On the first really rainy day that California has had in this nasty drought, I got a surprise from a tiny feathered visitor. 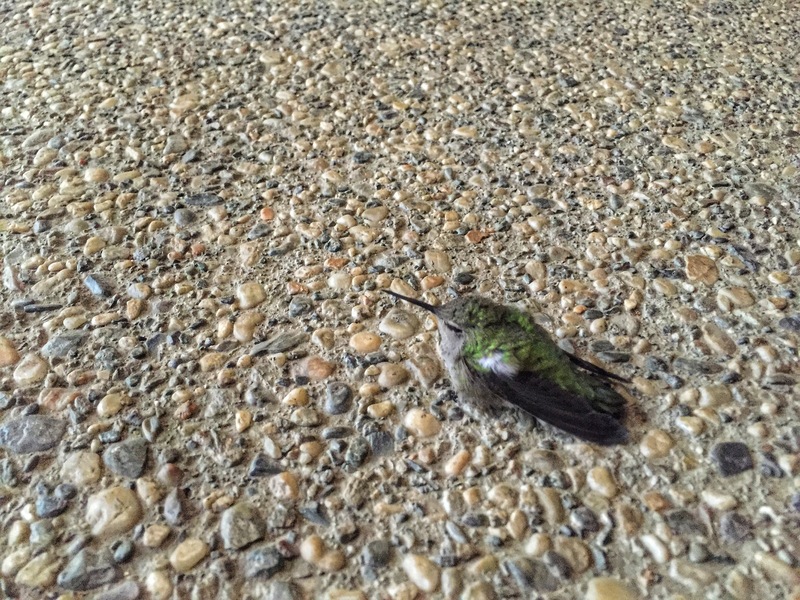 I was busy at work with our patients when one of my coworkers said “Hey, Christy, I saw this hummingbird near the back stairs outside, just sitting on the ground.” I must have had a startled look on my face because she went on to tell me that she thought it might be dead because when she got real close it didn’t move. 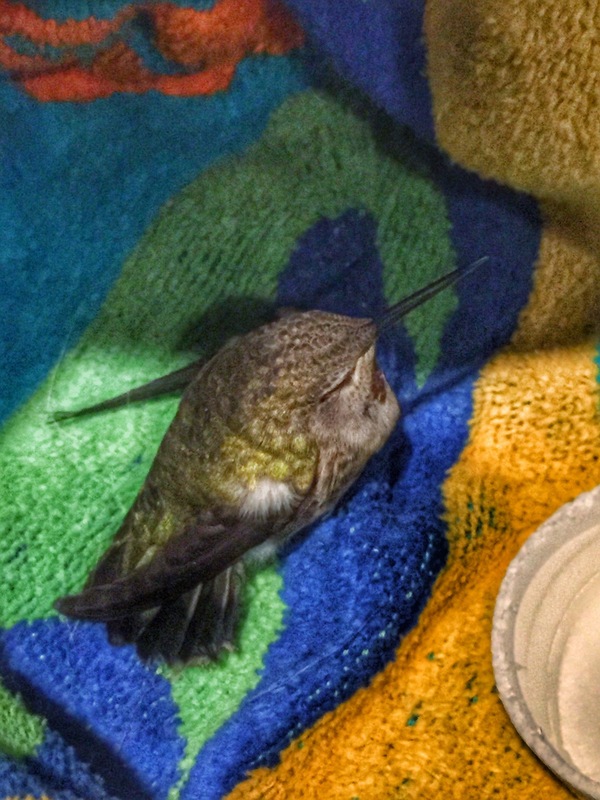 Naturally, I can’t pass up any kind of animal, especially one in need, so I rushed outside, and sure enough, a little female Anna’s Hummingbird huddled on the cold concrete of the back stairs of the courtyard. I prodded her gently with my pen (you don’t want to touch a dead bird because of disease), and she moved, just a little. I promptly but gently scooped her up and rushed her inside where we found a small towel and put it inside a box for her to rest in. We also made up some sugar-water from those individual sugar packets for coffee into a cut down Styrofoam cup. I put her in there with the cup and folded the towel over the top to keep her dark and quiet to recover. I know that there is a local bird rescue, but I was pretty sure that they close rather early in the day and I wouldn’t be able to reach them — or they me — in time. I left her alone for about an hour while I went back to work. 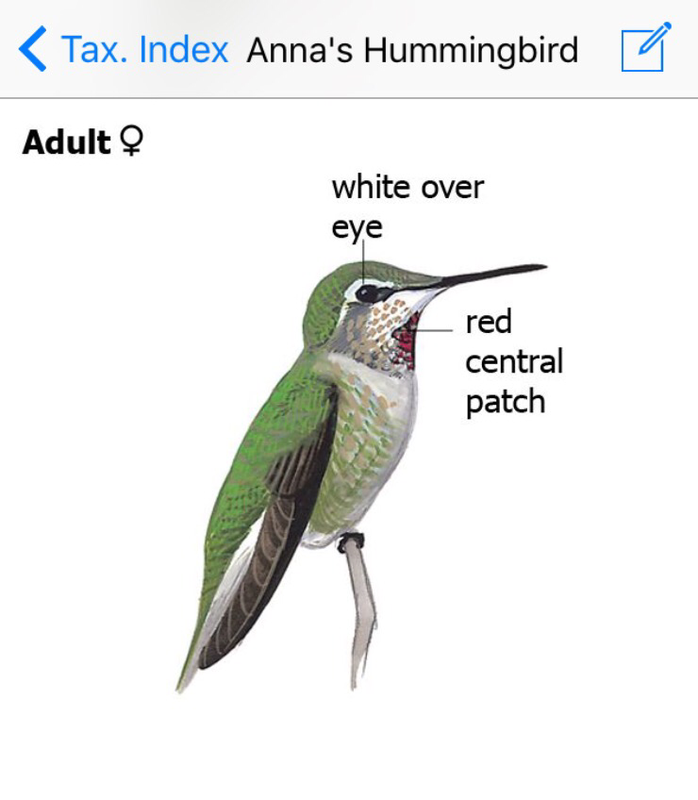 In between patients, I tried to look up info on how to care for hummers that might be hurt or cold. I also found out that you can heat them up a bit holding them under a lamp, and that you have to put their beak in the sugar-water to get them to drink, since they won’t drink on their own like other birds. So I scooped her up, held her under a warm lamp for a minute, and got her to start drinking a bit of the water mixture. I went back every 30 minutes or so and kept encouraging her to drink some more. It was really neat to see her drink. Her little tongue is so tiny! Each time I visited her, she seemed more bright-eyed and strong. It was starting to get sort of dark, and the worst of the storm had passed; it seemed like the best time to try to release her. I picked up her little box and took her back outside near where I found her, knelt, and put her on my hand so she would have a decent platform to fly off from. She didn’t fly. She sort of stumbled and flopped from my hand to the concrete and just sat stunned. Well, I didn’t want her to get cold all over again, and I was beginning to worry that she was injured. I picked her up and deposited her into her little towel nest and took her back inside. I gave her more sugar-water a couple of times at later intervals, but she still didn’t seem interested in more than that. Then the last time she took off from my hand and started flying around the room! Luckily it was a small exam room, with both doors closed, and she didn’t have any way to escape. I quickly turned out the lights and picked her up from where she landed on some shelves and immediately took her outside. It seemed she was ready to go! Once outside, I unwrapped her from the box and off she flew, eager to go. She flew off, flying up towards the light on the stairwell ceiling and fluttering around there before landing on the stucco shelf of the skylight. I tried to coax her away from there and out into the open courtyard and then hopefully she could find her way home, but it was already getting pretty dark and she just liked that light. I said a little prayer for God to watch over her, because I tried my best and it was up to Him now to take care of her. I’m praying that she’ll make it through the night tonight and fly away somewhere warm, filled with nectar giving flowers.